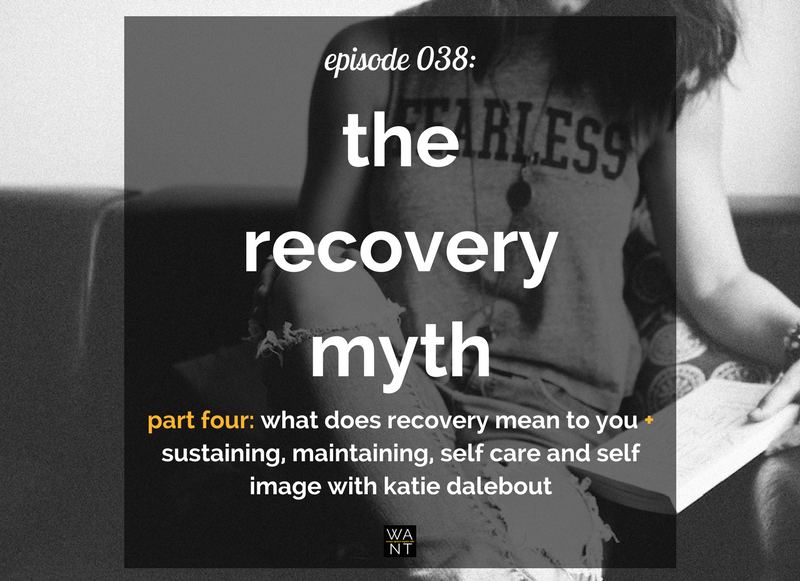 In the FINALE of The Recovery Myth miniseries, we talk about what recovery REALLY means…plus we’ve got Katie Dalebout on, who talks all about sustaining, maintaining, body image, the perks and pitfalls of “self care” and “wellness,” and how relationships come into play when it comes to a positive and proactive recovery journey. Update! The Recovery Myth will be coming back in each 20-episode season of the WANTcast! Be sure you’re subscribed to stay up-to-date. For the final installment, we’ve got two parts to this episode: I wanted to talk about what recovery means to me...but as I was editing an upcoming episode, I realized that our conversation around eating disorders, body image, and recovery was so good, I had to share it now. So as a bonus, I’m going to give you a nice big chunk of my conversation with the incredible Katie Dalebout, host of the Let It Out podcast and author of Let It Out: A Journey Through Journaling. Through her speaking and writing, she aims to help people develop a positive image of their bodies by embracing their creativity & personality outside of their physicality. Kind of perfect for The Recovery Myth, no?